Born in 1972 in Novosibirsk, Russia. Graduated Knarkov Institute of Art and Industry, department of Monumental Art in 2001. 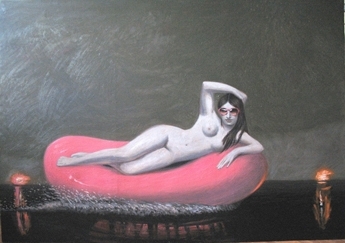 2010 Relish, YA GALLERY art-centre, Dnepropetrovsk, Ukraine. 2008 Sea. Star. Oil, "Kien Fine Art" Gallery, together with T. Polyashenko, Kiev, Ukraine. 2006 Plastic flowers, ZEH ART Gallery, Kiev, Ukraine. 2005 Toxic and coldblooded, ZEH ART Gallery, Kiev, Ukraine. "√-1" Art-project, Kharkov Municipal Art Gallery, Kharkov, Ukraine. 2002 Communication, Art-club, together with T. Polyashenko, Kiev, Ukraine. Initiative "Project -02", "Twin-story" art-project, together with T. Polyashenko, Kiev, Ukraine. 2008 Women Day?, "Kien Fine Art" Gallery, Kiev, Ukraine. 2007 Generations.USA, PinchukArtCentre, Kiev, Ukraine. 2005 2.Internationale Kunstlerkolonie, Shloss Almoshof, Germany. 2004 A New Year card, RA Gallery, Kiev, Ukraine. Children of thrash, Biennale of actual arts in Ukraine, Ukraine National Art Museum, Kiev, Ukraine. 2003 They are looking for us, GELMAN Gallery, Kiev, Ukraine. "Look 21 - new version" Art-project, Soviart Gallery, Kiev, Ukraine. 2002 Sinn & Form, Consumenta, Nuremberg, Germany. 2001 "Without cover", "4th block" Gallery, Kharkov, Ukraine. 2000 Side by side, Kohlehof Gallery, Nuremberg, Germany. 1998 Little by little, "Naprotyv" gallery, Kharkov, Ukraine.